The murder of Ottawa rookie Cst. David Kirkwood, on July 11, 1977, launched a response that, today, has become the nationally recognized ceremony honouring police and peace officers killed in the line of duty. Following Kirkwood’s senseless killing, Ottawa police officers vowed to keep his memory alive and to ensure that the magnitude of his sacrifice, and that of others like him, would never be forgotten by Canadians. Accordingly, on Sunday, September 24, 1978, a special service and tribute was held. The site selected was Parliament Hill, the place where laws are made that directly impact on police officer safety and, ultimately, the quality of life for us all. Following that first ceremony, a number of features have become tradition and, at the same time, some modifications to the event have occurred as well. The ceremony was expanded to honour other police officers murdered in the line of duty and this criterion of inclusion was itself modified years later to include all officers killed in the line of duty. This current criterion has been applied retroactively, and names of officers killed in the line of duty, from years gone by, are now being added to the Memorial stone. The original ceremonies were limited to police and correctional officers killed but that criterion was expanded, in 1995, to include all peace officers so that all areas of law enforcement are now included in one single ceremony. On September 24, 1998, the Government of Canada officially proclaimed the last Sunday of September of every year as Police and Peace Officers' National Memorial Day. 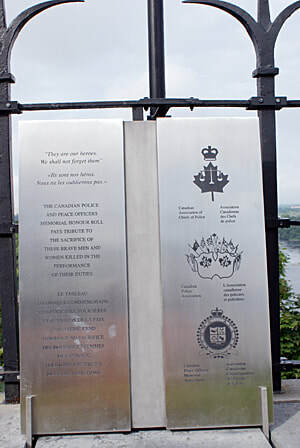 In announcing the commemorative day on September 27, 1998, the Solicitor general of Canada stated that "A formal, national Memorial Day gives Canadians an opportunity each year to formally express appreciation for the dedication of police and peace officers, who make the ultimate, tragic sacrifice to keep communities safe." On January 17, 2003 a nation wide half-masting was included in the new half-masting rules. The Flag will be half-masted on all federal buildings and establishments in Canada, including the Peace Tower, from sunrise to sunset on Police and Peace Officers’ National Memorial Day. During the 1984 service in Ottawa, a Memorial book of remembrance for police and correctional officers killed, while on duty, was introduced by the Office of the Solicitor General and the Canadian Association of Chiefs of Police (CACP). On March 22, 1994, Prime Minister Jean Chrétien joined the more than 700 police officers and relatives of slain officers at a site behind the Parliament buildings. The Canadian Police Association (CPA) and the CACP dedicated the new Canadian Police Memorial Pavilion and the granite stone at the base of the pavilion that displays the names of officers killed while on duty. When the granite stone was unveiled in 1994, it displayed the names of 227 police officers killed in the line of duty since 1879. Two other stones were also erected; one for peace officers who died in the line of duty and another explaining the pavilion’s history. In 1995, the memorial honour roll was expanded to include the names of slain officers from other Canadian law enforcement agencies, including, Ministry of Natural Resources, Customs and Excise, Fisheries and Oceans, and Conservation. As the turn of the millennium approached, the granite stones and memorial book presented several challenges. 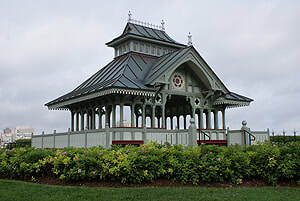 In 1999, the CPA, the CACP and the CPOMA worked collaboratively with officials from Public Works and Government Services Canada, to design a new honour roll to enhance the Memorial Pavilion site, compliment the design features of Parliament Hill, and provide sufficient space to recognize our heroes for another 100 years. 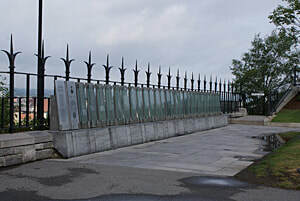 The parties agreed upon a glass panel monument, to be erected along the perimeter wall adjacent to the Memorial Pavilion. The new monument enhances the existing Memorial Pavilion, provides a lasting tribute to our heroes, and ensures that future generations will be provided with a striking reminder of the sacrifices of our fallen heroes. The new honour roll was unveiled in conjunction with the 2000 Memorial Service, as part of Parliament’s millennium celebration, replacing the granite stones and retiring the Memorial Book of Remembrance. The 1978 ceremony opened with a two-gun salute, fired by members of the 30th Field Regiment of the RCA. This symbolized a long-standing association between the Ottawa Police Service and the 30th Field Regiment, also known as the Bytown Gunners. Both were founded in 1855 and have a long history of mutual support in difficult times; from civil unrest, in the early days of Canada’s history, to royal visits in later years. After the salute, one brass shell case was saved and mounted as a commemorative piece with the inscription: “To fallen comrades, Parliament Hill, September 24, 1978”, along with the badges of the Ottawa Police and Bytown Gunners mounted above and below the inscription. The piece was presented to the Ottawa Police Service on July 7, 1979.